The humble beginnings of soup-a simple, filling and easy-to-digest dish that can stretch available ingredients to feed a crowd-evolved into a nutritional and culinary staple that helps define modern regional cuisines. Combinations of meats, vegetables and grains are popular soup ingredients, and dairy products likewise play a critical role in many recipes. Soups with cream, milk or cheese bases, as well as those garnished with cheese or sour cream, make up a large segment of menu offerings in U.S. restaurants. As enhancements to the main course, sides help balance menus and tastes. Simple side items such as baked potatoes or steamed rice often serve as a mild foil for intensely flavored foods like grilled or roasted meats and spicy Asian or Hispanic dishes. Meanwhile, the more complex sides such as potatoes au gratin or risotto act as stand-alone complementary dishes. Cheese and dairy products made in the United States can transform soups and sides into a meal contribution as memorable as the main course. Learn more about U.S. dairy products by browsing the Product Section. 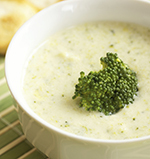 Cream soups remain very popular, with at least one variety offered by virtually every U.S. full service restaurant (FSR) and family-style restaurant. However, demand for lighter fare driven by health and wellness trends provides spark to broth- or vegetable-based soup item offerings. Pureed vegetable soups are newly trendy in upscale establishments, and often incorporate dairy ingredients. Potatoes as sides-once-baked, twice-baked, au gratin, escalloped, roasted, toasted, mashed, smashed, fried or prepared in some other way-retain favored status, with some form of potato side available on every menu in every U.S. restaurant segment. Consumer demand for lighter fare has led to new pureed vegetable soup offerings displacing cream-based soups on menus in some U.S. restaurants. Use of milk and chicken stock in place of heavy cream creates soups with a lighter feel. Pureed vegetable soups like roasted butternut squash or carrot often blend in fresh cheeses like cottage cheese or ricotta, or melt in firmer cheeses like cheddar or monterey jack, to provide additional texture and taste. A dominant player in Western cuisine side dishes, potatoes are used widely across all U.S. restaurant segments. Consumer diet plan trends that strive to eliminate carbohydrates have slightly reduced overall U.S. potato consumption in recent years. But potatoes continue to provide a nutritional package high in vitamin C and potassium as well as supply essential dietary components of fiber and starch. Indeed, potatoes contain every vital nutrient with the exception of calcium, vitamin A and vitamin D. Potatoes and dairy products are natural partners, as the starchy and mildly earthy potato not only balances the rich flavor of cheese and dairy, but the combination provides a full nutritional package. From gruyere cheese in scalloped potatoes to aged cheddar on twice-baked potatoes to sour cream, milk or cream cheese in mashed potatoes, dairy and potato pairings create popular side dishes.